Augusta, Georgia is known for good food and GOLF. Pimento Cheese sandwiches are a tradition at Augusta National Golf Course for the Masters Tournament every year. They are so beloved, in fact, that popular demand keeps them on the menu year after year. Pimento Cheese is often called the “caviar of the South.” What better topping is there for a Southern Style BBQ burger featuring No Name Brand Bacon Cheddar Steak Burgers? 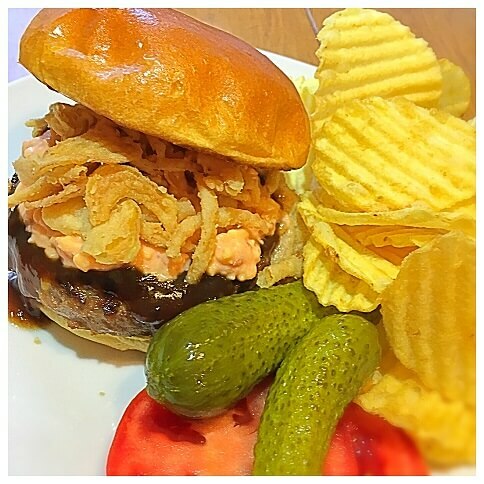 Tangy BBQ Sauce, crunchy fried onions and home-made Pimento Cheese will make this a burger that is demanded year after year at your house too. In a large mixing bowl, place the cheddar cheese in an even layer. Scatter the cream cheese, pimentos, mayonnaise and spices across the cheese and mix well with a spatula until the mixture is well incorporated, about 1-2 minutes. Let sit in the refrigerator for at least 20 minutes before serving. Best if made the day before. Split and toast the buns. Place a cooked burger on the bottom half. Top with BBQ Sauce and Pimento Cheese. Top with French’s Brand Crispy Fried Onions. Top with a toasted Brioche bun top.